Thank you, readers, for the letters you sent along with donations to the editorial board's school-supply drive. Some donors to The Seattle Times editorial board’s school-supply drive tuck a love letter into the envelope with their check. The editorial board started this drive 19 years ago because of concern for children whose families couldn’t afford the long list of supplies many schools request each year. That concern continues to drive this effort. 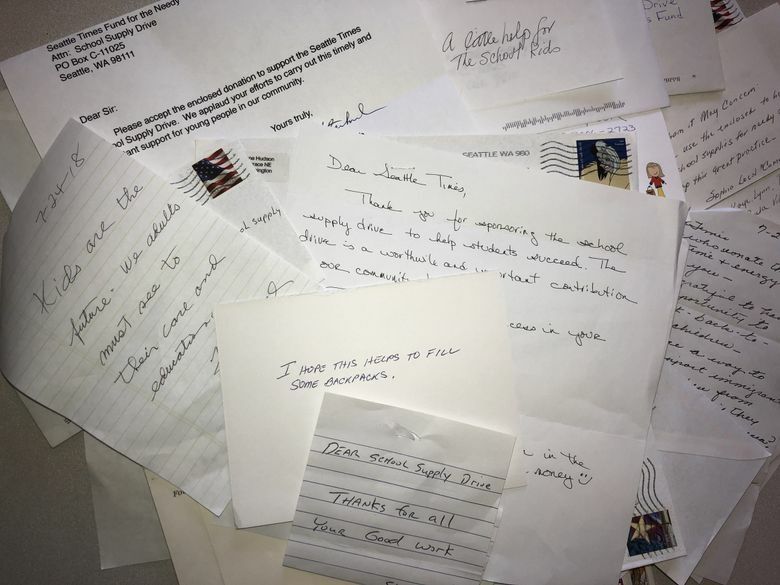 And Times’ readers demonstrate they share that perspective by increasing their donations every year and through the mostly handwritten notes they send along with their checks. “The drive is a worthwhile and important contribution to our community!” wrote Josephine Hudson of Redmond. Some letters and emails go beyond the drive and offer further help or suggestions for other ways people can help their community. Some talk about office collection drives and request information about where to deliver those donations. One letter simply offered assistance. “If I can help in any other way, please call me,” offered Jean Dunbar along with a donation mailed from Port Townsend. The school-supply drive isn’t just about raising money for three nonprofits — Hopelink, Seattle/King County Coalition on Homelessness and the YWCA Seattle-King-Snohomish — that buy backpacks and school supplies for more than 5,000 children in King and Snohomish counties. The editorial board seeks to inspire people to improve kids’ lives, through the drive and its other opinion pieces. For some readers, the drive brings backs memories of sending their own children to school or years spent in the classroom, scrambling to help the students who couldn’t afford the supplies they needed at school or home. Thanks for your donations (and letters). They make a difference. Donations are still coming in to the drive that runs through September, but 858 Seattle Times readers have already given more than $114,000 this year. Please keep giving. The need is great.